Did I use that pun before? Well. Nothing much happens in the pun department at Argapa Ukuleles. I have picked out rosewood for the bridge but am considering putting the finish on first, like proper builders who know what they're doing. My excuses for putting it on before the finish have so far been that I hate acraping away the finish (for fear that I might bodge things up), and that makers of classical guitars are said to doing so. In the humble abode of the Argapanator, things are set in motion. I have this old guitar that a friend gave to me, with split braces and a bowed neck. No truss rod. So I googled "straightening guitar neck" and found this method. The neck is heated carefully and placed fretboard down on a perfectly flat heated surface. I used a stone sample and a thick piece of duralaluminium (at least in Swedish). Both was heated in the oven to 85-90 degrees centigrade. I shimmed the neck at the nut end and at the 12th fret, then clamped it down using cauls of moldable plastic. After two attempts, it looks as if it worked! I might try it on another guitar as well. I decided that I wanted to try a carbon fibre rod in the neck, even though the lamination makes it strong enough. But then I wondered how I would drill for the barrel bolt if the carbon rod was there. So I used two instead and the bolt goes between them. The neck is attached and the fretboard is planed. Maybe things will be moving along fast. Or maybe the day job will almost kill me with all the stuff I need to do before christmas. I don't use too many safety precautions, and since I avoid routers and rotary sanders I have all fingers left in decent condition. But this, what a difference it made. The leather strip I glued on my depth stop for cutting the pegs helps me; before I put it there the saw always flew into my left hand at the last cut. And these saws are so sharp! So the Argapa #55 turned out to be a strange beast. Half uke, half lute and it sounds just like an Argapa uke. It has all the characteristics of a prototype, I "solved" problems as they came. But it's probably going to stay as a one off. It hasn't done anything wrong yet, but it's gonna be sent to Australia none the less. Working with cherry is so rewarding that I sometimes wonder why I even bother with other woods. And the soprano size - well it doesn't get any better or more ukey than that. Top and back are bookmatched and I chose to laminate a neck blank with a pin stripe of contrasting woods. Building is very fun right now. A massive effort last weekend has left the workshop tidy and well organized. The kids have spent the day sewing small plush toy figures, and I have serviced Robert's piccolo (Argapa #14), continued finishing the mock lute, slotted the neck on Mary Agnes's piccolo. And I've bent the sides for a new cherry soprano. Order list is still a mess. If you think you have made an order and your uke doesn't show up in the blog, let me know. I will apologize (and tell you the dog ate your uke). Some of these go-bars sprung free after two hours, fell rattling to the floor and ruined a recording we were doing. I made binding rabbets without any use of power tools, and they turned out good! But it wouldn't have worked on a figure eight shape, I used my miniature shoulder plane a lot. My home made gramil isn't perfect yet. But this one is gonna be good looking. And Mary Agnes's piccolo, maybe I can fit the back braces tomorrow morning before I go back to Palestine for a few days. 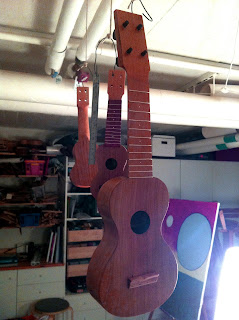 First pic shows the neck joint on Mary Agnes's uke, I managed to carve an excellent neck and get a perfect neck joint. Second pic is the polished back on Jörgen's uke. Now I'm gonna string it up. Mary Agnes is a force of good. And she wants one of my piccolos. It is well underway, I'll carve the neck tonight and then it's really not that much left. Yet another piccolo, almost done. This one is for a fellow uke player in Stockholm. I've gotten about four layers of shellac on and it's time to level sand a bit before the last coats. Hardly seen behind it is top and sides for the next one. Brian was kind enough to send me some good pictures, since I completely forgot to take any before I sent it. So here it is, in Arizona. Anyway, a friend had it, his kid stepped on it, and I got it. The mahogany soundboard was shattered so I took the remains off and put a spruce soundboard on. With a novelty soundhole. I have no idea what to do with this one after it's finished. Next is a uke that wants to look like a lute. Because I have a friend who is a medieval jester. But hey, who hasn't? It'll be a one-off, but I think it's gonna be nice. And then finally number 53, the un-ordered soprano that got ordered during building. I polished it and strung it up, and I must say it served its purpose. I wanted to build it for my own sake, with the intent of getting the joy back into building. And it's a bit quirky, the first soprano with a one piece rim, and some elaborate-ish carving efforts on the neck. And it sounds GREAT. I am so glad I made it. The cherry reso is moving forward, I'm really pleased with the neck. The cedar top soprano is bound. I won't say the binding is everything I hoped it would be. But other than that I think it has great potential. I found a neck blank I made some time ago and I'll use it for the soprano. It's a bookmatched mahogany neck with some really good looking grain in the headstock. But it was really hard to carve. I usually go directly from knives to 180 grit sandpaper, but this wood wanted to splinter and tear so I had to make the final shaping starting with 40 grit. That's as coarse as asphalt. But, as so often the case is with ukuleles, it turned out nice again. Well. Some things at the Argapa stronghold have been a tiny bit below par this year. I have built a couple of ukes that I wasn't completely satisfied with. Both are still here. Others have turned out really really good. But I need to think about my routines. So for the upcoming season I promise myself not to build when I'm not in a good mood. I'll not build for others than I want to. I'll make sure to finish stuff I've started ages ago. This week I upgraded the workshop / workbench by mounting the solera on the wall, and the go-bar deck is stabilized by hooks that the threaded rods go through when they're attached to the board. It made a big difference. The solera-free workbench is also secured to the two walls in its corner, so it won't rock when I plane stuff. And on to the pics then - on the solera is the first soprano with a one-piece rim, it'll be a cedar top mahogany uke with binding around the soundboard. (I tell you about it so I can't chicken out of binding it.) The uke is the first in a long time that isn't ordered, I just felt like building a soprano with a softwood top. And in the other pic, you can see a resonator! I got cones and coverplates from Chickenbone John in England. The first one I finish will go to Arizona, Brian has helped me out for years now. But the coverplates have those holes for the strings, I'll probably make a stringholder across them to save the nylon strings from snapping. Stay tuned, I can promise all of you that some great ukes will be made now! I found a bloke in Sweden who sells Knew saws, and Veritas tools! I've bought stuff directly from Lee Valley / Veritas before and it's really no trouble at all, but it is simpler to see the sum in kronor, taxes included. So I bought a Knew saw that I have wanted a long time. Took tjis pic to show what good results a 7-year old and a 10-year old achieved with just a little help. I chose a rosewood bridge / saddle on the miniatures. I had to go over them a couple of times to adjust the action. In the pic you can see my miniscule shoulder plane (and some excellent shavings). It doesn't make them a lot more playable, but it did improve the intonation. Inspired by Ken Timms' marvellous creation, and a bloke with a blog called The Village Woodworker, I finally made a decent soundhole cutter. The blade is from an old Taylor chisel, with the stamped acorn. It's easy to choose radius, the piece in the middle with the pin slides, guided by the dowel going through the piece at the end. It would work for rosettes as well, but I've never felt the urge to make one. Perhaps now with this tool I'll try. I got a strange looking bookmatched piece out of the board. What looks like beautiful curl is marks from the bandsaw. I plan to try a fairly thick top with light ladder bracing. There is tone in there and I'm gonna get it out. This used to be a boat. Built in 1899, it's on the last lap now. Just for fun I have salvaged a board from it. Maybe I can use it for... (drum roll) a ukulele! From left: numbers 51, 48, 50, 49 and 46. That means I have made 11 ukes so far this year, if you'd be willing to call the two toy thingies "ukes". But they do work! Scale length is 160 mm. Weight is 63 grams. Now I'll take a break. I won't bring any project to the summer house, I've got enough to do there as it is. Of course, there's all that alder and cherry to resaw. And the reclaimed spruce log. Gee, perspective can really play tricks. Those ukes in the back look really small compared to the piccolo in front! And the other pics, look at the size of that watch. Hilarious. If they were as small as they seem, what good would they do? Well one might be on offer in Hollesley, I hear there are all sorts of gullible people attending this year. Well I think it's safe now to say that two piccolos will come with us to Hollesley. Maybe I can make a third one if I can create some flow. But, at least the two in the pic. Just a short post to show the thin mdf caul I made to distribute the pressure from the go-bars. It turned out a lot better than the other methods I've tried, with smaller patches under each bar.